I’ll show you the exact steps and specific directions in my training videos to help you become a successful notary public loan signing agent - and you don’t have to have any experience or existing knowledge to do it. "Here are Some of the Secrets You'll Learn Inside My Informative Videos"
​As someone who personally does 3-8 signings per day and literally does thousands more per year with my loan signing company, I see first hand what makes a loan signing agent successful. You won’t find this kind of information anywhere else. I guarantee it. You don't need any experience in the mortgage industry. You will learn mortgage definitions and terminology along with what every loan doc means. I’m going to teach you step by step how to do a complete loan signing and get the loan signing business so you can achieve your financial goals. Now the best part about the loan signing system, is that you don’t have to wait for the mail to get the DVDs and you don't have to drive to the store to get it. I’ve been told I should raise the price to several hundred or a thousand dollars, because if you can do a couple loan signings a month, that's $2400 to $3600 or more in your pocket per year. And it would be worth the cost. But I wanted it to be accessible to you. It's yours RISK FREE for only $99. A savings of over $50! So let’s wrap this up. 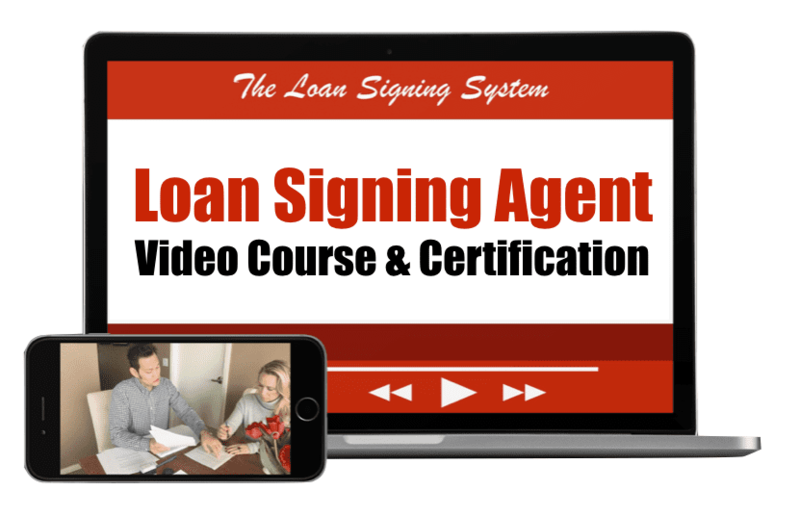 My full video course - The Loan Signing System - What every notary should know to become a successful loan signing agent. 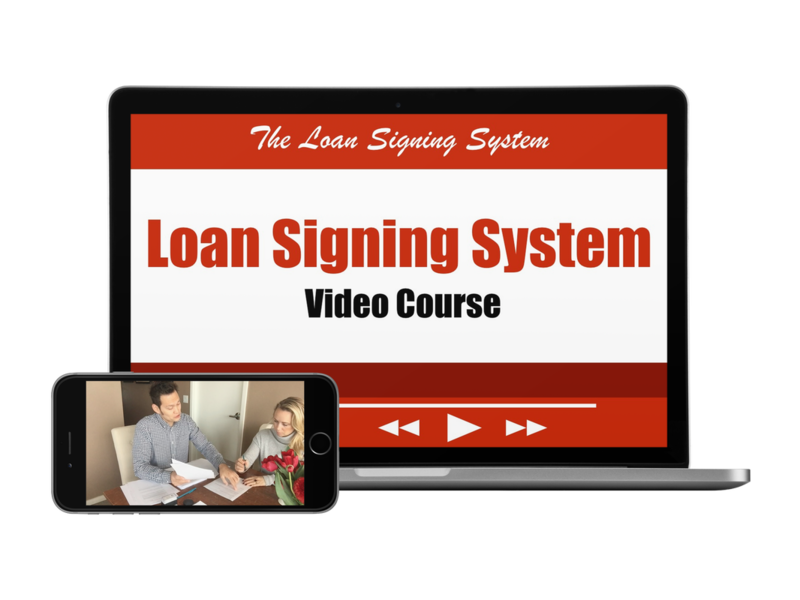 You’re going to get the complete video series broken down into two parts with ten step-by-step videos on how to do a perfect loan signing AND get loan signings. You’ll get access to start watching the videos right now. A full set of 130 page loan docs. The notary guidelines that I give to every single loan signing agent I hire. ​And all my cheat sheets for loan signing forms. You’re going to get my 4 bonus recordings of actual loan signings so you can hear exactly how to conduct a perfect loan signing over and over again until you master it. Next you’re going to get my video of the loan signing system in action as I go through a full loan signing - Here’s where I’ll share my three key techniques to ensure the loan signing is done in 45 minutes or less so you can maximize your income. And the most unique thing about my course is I teach you step by step, my secrets in getting loan signings. I’ll show you how to get the loan signings so you can be on your way to making hundreds or thousands of extra cash per month. You’ll get three videos on how to get loan signing service loan signings as well as direct escrow loan signings. As a bonus, I’ll give you my video on how to fill out your journal and invoices. As well as a database of escrow offices in your area so you can start getting loan signings this week. Now I couldn’t possibly imagine why you wouldn’t take these steps to learn to make $75 to $150 per hour as a loan signing agent. But to make you feel as confident as I am to drastically and dramatically improve your success in becoming a successful loan signing agent, I’m going to offer this for only $99 with a full money back guarantee. This is the cost of a single loan signing. And if you don’t like what you see, simply email me, and I’ll personally see to it that you get a full refund of your money. Now, of course, I wish I could have had this course many years ago when I was first starting out becoming a loan signing agent, and I know that you are going to be glad that you made the investment in yourself once you have your first success after going through the course. Every single day, a home purchase closes or home gets refinanced. And every time that happens, you could be making $75 to $150 or more per hour. You may already have a notary commission...if so, you’re sitting on a money making asset. There are ways for you to get loan signings today without doing so much as lifting a finger. And you could immediately start making $75 per hour or more. No certification is needed. Just your notary commission. Are you going to capitalize on the loan signings that are happening every day in your own backyard? Or are you going to let each of these opportunities slip by and never know what might have been? So take action now, don’t delay, select your course below and let’s see you get immediate, dramatic improvement and success as a loan signing agent. So download my course now, and I’ll see you at class!